We took a train to Zermatt from Sion, where we spent the night to see the famous (or infamous depending on perception) Matterhorn. Zermatt is a small holidaymakers-centric town flanked by gorgeous mountains and it mainly comprises of hotels, hostels and vacation houses. There was also a cemetery for mountaineers who attempted Matterhorn but unfortunately didn’t make their way down. To see the Matterhorn, we had to first decide on the viewing angle and the price we were willing to pay to see it. If I remember right, there was an option between the cable car which goes to the highest point and the tram which makes multiple stops along the way and do not reach the highest viewing platform in Europe. In the end, we picked the tram ride to see the mountain exactly as it is represented by Toblerone. The view was stunning, it was quite an experience to be standing there at the Alps surrounded by many snow-capped mountains. It wasn’t as cold as I expected thankfully and we walked around for a couple of hours in that area just admiring the mountains. I had yet another experience of walking on snow wearing Converse shoes and I am glad that I survived. I remember seeing glaciers – light blue, clear and mesmerizing, I remember seeing some mountain deer, I remember seeing the Swiss-Italian border, I remember the white snow reflected the sunlight and impaired vision to some degree and I remember seeing tourists taking jump shots for over 20 minutes at the same spot. We took the train from Zermatt towards Spiez and I really enjoyed the scenery along the way. There were many beautiful mountains, waterfalls and a very clear river running alongside the train track. 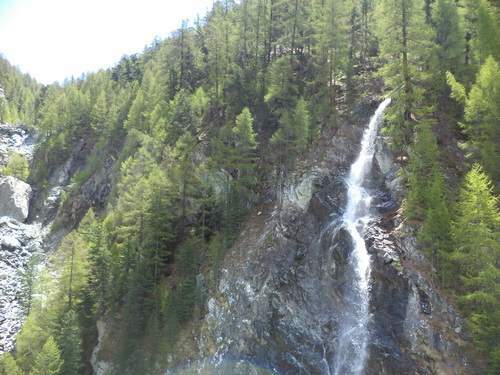 Nature is so wonderful and sometimes I wonder who decides which mountain/waterfall is the most suitable tourist site. Spiez is a small, pretty typical Swiss town – it has vineyards, colourful houses, a castle and a lake (Interlaken) with many sailboats and yachts. We wandered around the vineyard and I was surprised that no one came to bother us (where are the people??). This picture pretty much sums up what Spiez is about. 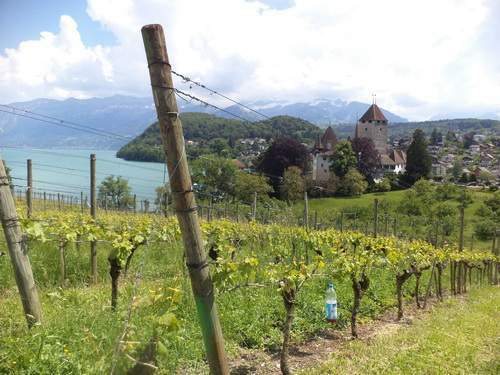 We had some local wine at Spiez and after which we took a boat ride from Spiez to Thun. The Interlaken lake is blue-green which is pretty different from the blue Lake Geneva. Anyhow, the view was still spectacular – there were many mountains on one side and houses on the other. I was quite fascinated by the houses by the lake with basements that are used to store their own boats. There were already some sailboats on the lake even though that was still quite early in summer. The next time I visit Switzerland, I would love to try some water activities on its lakes. 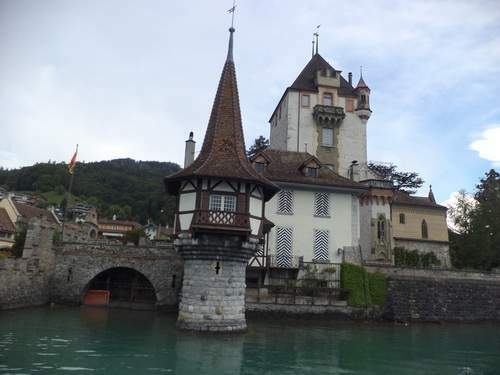 We didn’t see too much of Thun which looked like an industrial town and we went straight to Bern by train. Bern, a German-speaking town, is the administrative capital of Switzerland. The architecture in Bern is quite different from what I had seen so far because the colours were a lot duller and more monotonous. 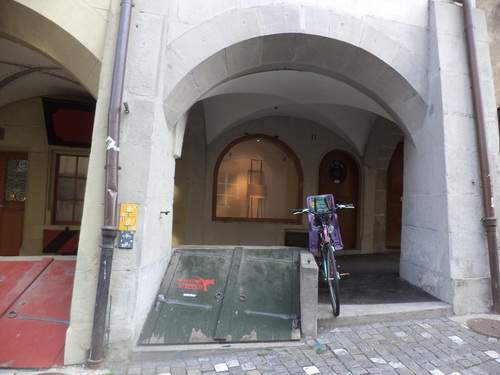 The Bear Pit is one of the well-known attractions in Bern but when we visited it, there were no bears there. 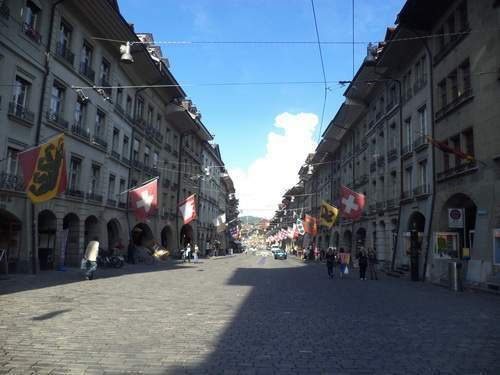 The old city of Bern is actually a UNESCO heritage site by itself. What surprises me about Bern is that coming from Asia, I imagine capitals of countries to be huge, busy and cosmopolitan. However, while Bern is busier than other Swiss towns that I have been to, it is still a lot quieter and relaxed as compared to every Asian capital that I have seen so far. The roads in Bern are pretty interesting as well because pedestrians walk in the middle of the road between the two car lanes with an imaginary line. Occasionally, there are colourful Renaissance fountains in the middle of the road as well. 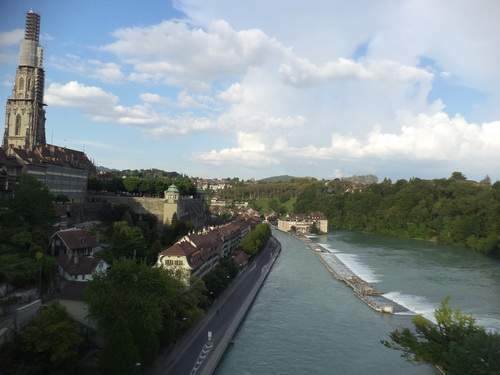 Bern is framed by the U-shaped section of the Aare river and I wonder why people built a town at this section of the river. If I remember right from my Geography classes, judging from the shape of the river, this is the middle course of the river with meanders and it has more energy and volume. Usually people build civilization at the lower course of the river so that they can practise agriculture beside the river. Anyhow, they built a town and it has been functioning quite well. The dam (I am not sure when they installed that) puts the river’s energy into good use for hydroelectric power purposes. Click here to learn more about travel to Switzerland.